The array of hotels in Georgia's historic jewel, Savannah, can feel bewildering. B Historic Savannah Hotel is an easy choice. This welcoming, modern hotel has what luxury travelers want: a fantastic location in Savannah's historic district; rooms that are stylish and quiet; and an outstanding hotel restaurant and bar. And with all this, you still get great value. One of the best reasons to choose B Historic Savannah Hotel: this hotel is fashionable yet remarkably affordable. It's a great value in a city destination not known for bargains. B Savannah Hotel is nearly as nice as the town's handful of five-star hotels, yet much less expensive -- so you can spend your savings on Savannah restaurants and shopping. This is a compact hotel, with 101 rooms and suites. With its small size, personal feeling, and stylish, contemporary rooms, it fits the definition of a stylish, independent-spirited hotel. If you feel lost in big, impersonal hotels, this is your place in Savannah. The part of Savannah where visitors want to stay is the riverfront historic district, which looks and feels very much the way it did in the 1800s. B Historic Savannah Hotel is right here in the historic district. Hotel guests at B Historic Savannah can walk everywhere in the historic district, which is only two square miles in size. Next: will you, yourself, like B Savannah Historic Hotel? Take the hotel personality quiz! 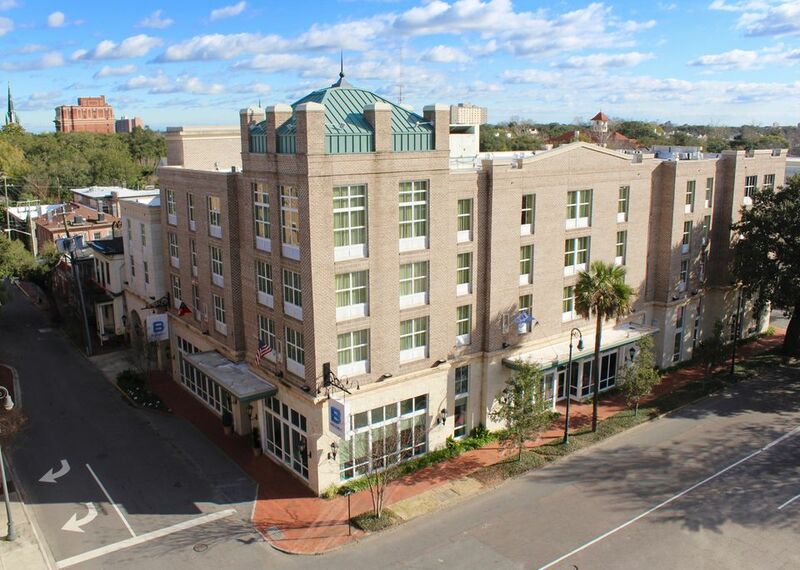 Will B Historic Savannah Hotel Be Your Best Choice in Town? Will You Like Staying at B Historic Savannah Hotel? B Historic Savannah has 101 rooms and suites on five floors. The hotel gym is accessible free of charge to guests at all times. Savannah is an American culinary destination of national renown. In this popular getaway town, you'll find Southern cooking at its best. B Historic Savannah Hotel houses one of the most talked-about restaurants in Savannah, Kitchen 320. The restaurant serves breakfast, lunch, dinner, weekend brunch, and wonderful cocktails at the bar. Restaurant 320's executive chef, Will Herrington, was raised nearby on the Southeast coast's "low country." Today he is a leader in the local movement to modernize and lighten up Southern food. Whatever labels you put on Chef Will's food, one thing's for sure: it's beautiful to look at and bursting with flavor. Set within Kitchen 320's lobby-level space, the bar of B Historic Savannah Hotel offers relaxed seating and top-notch libations. Kitchen 320's drinks are never dull. And they're strong. These drinks are modern interpretations of classic cocktails such as the Manhattan or Old Fashioned. They're made with only fresh ingredients (nothing powdered, pre-packaged, or with a chemical aftertaste). And whatever you order will have a lively flavor twist. • A tasty example: the house's Bloody Mary, from the "day drinking" menu. It's made of carefully house-mixed Bloody Mary base. It arrives festooned with candied bacon. It's at least double-sized yet only $10. Heaven!